A waffle iron or waffle maker is a handy appliance for delectable waffles. Some units have reversable plates with a flat side for making pancakes. 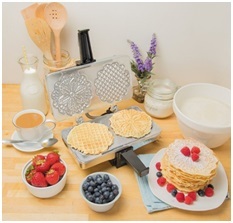 The best waffle makers are evaluated below for you to select the best one for your kitchen. The plates are molded with a honeycomb pattern that you see on your finished waffles. Waffles are made of a sweeter batter than pancakes. The batter is poured onto the plates and hopefully with practice, does not run over the sides of the waffle iron. Read more in my waffle maker reviews below. Home breakfast making is on the increase. Get up with the sun and make for your family sitting together talking to enjoy a good healthy meal. Restaurant breakfasts are so expensive, and I don’t like the brand of bacon most use. Waffles can be square, round, heart shaped and other shapes as well. Pancakes are flat and usually round as you pour the batter onto the cooking surface. Kick start your day with a nutritious breakfast, the most important meal of the day. Kids need to have a full stomach when they go off to school for concentration and energy. I like breakfast food for dinner too and so do others. Get creative and use your best waffler maker adding fruit and nuts. Vegetables might be good too, although I’ve never tried them. Eggs are wonderful with waffles, sausage, and/or bacon. People are now making 90% of their breakfasts at home during week days and 84% during the weekends. That’s impressive for staying out of restaurants with small eggs and not so great waffles and pancakes. If you want an old-fashioned stove top cast iron waffle maker, read about it at the link to Amazon. Season it as you do all cast iron skillets, put the lid down, or take the top off and put it on another burner to make more 3-inch waffles at one time. A great Disney® Micky Mouse waffle maker for the kids is here. It’s adorable with ears that kids eat first! Smother with butter, fruit, light syrup, jelly, honey, or whatever your youngsters like best. 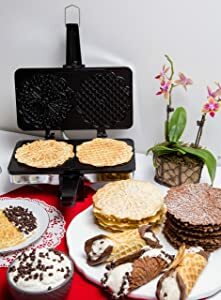 Many people who love to make the classic breakfast waffles also love to make the pizzelle (say pit’ tselle) an Italian waffle cookie made from flour, eggs, sugar, butter, and flavorings. They are crispy, sweet, very thin and are usually flavored with anise, anisette, vanilla, or lemon. I like to put raspberry flavoring in mine. I add that flavor to my iced tea too. You can make these hard and crisp or chewy and soft if you are unfamiliar with them. This is the oldest type cookie ever made going back to the ancient Romans. Pizze means round and flat, hence the word pizza. 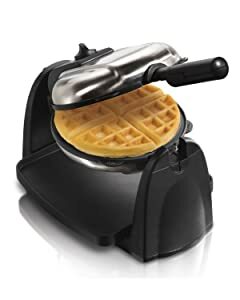 You put the batter into a pizzella iron that looks like the waffle maker. The iron pattern is sometimes a snowflake, a heart, or other shapes. They can be folded over to look like cannoli. 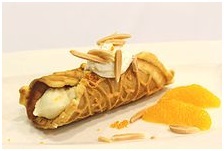 The one in the picture is filled with orange almond crème and topped with whipped cream and almonds. I’m ready to dive into this one now with coffee. You can put two together for a sandwich filled with fruit and other tasty delights. They are prevalent during Easter and Christmas and very popular at Italian weddings. The Presto® company has been around since 1905 making the very best pressure cookers and other great kitchen appliances for cooks. The model number 03510 is ceramic so will not stick.Teflon® is not used with this single waffle maker. The extra-thick 7-inch diameter grid is cleverly designed to do a 180-degree flip that will spread your batter evenly to have crispy outside edges with the inside being fluffy and tender. This unit is one of the best Belgian waffle makers. The unit is easy to store since the base locks into a vertical position using less storage space. The digital timer counts down and makes a sound when the cooking time is finished. The outside is brushed stainless-steel for great looks and wipes down easily. The plates are not removable and clean up nicely being ceramic. The 1-year Limited Warranty applies to the USA only. The Belgian waffle maker is free of PTFE, PFOA, lead, and other heavy metals. Plug the 2-foot UL® listed cord into a USA/Canada 110/120-Volt, 50/60 Hz outlet. In other countries you will need to buy a 220/240-Volt adapter to make it work. The 1100-Watts gets the plates hot for thorough cooking. Gift-wrapping is available for someone you want to give this to. You will receive a User’s Manual with recipes and a measuring cup. The design, marketing, sales, and distribution of this product takes place in the USA. The actual manufacturing is done in China. Quality Testing is done in both the USA and China for the Presto® FlipSide™ Belgian Waffle Maker. How the Presto® waffle iron works video. This is the older version with Teflon® no longer used today. Customer review making waffles video. The Cuisinart company has been making kitchenware for over 30-years. 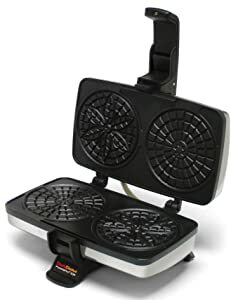 This double waffle maker, WAF-F20 made of stainless-steel and available on Amazon.com®, is sure to please your family serving more than one person at a time. The browning 6-setting control is adjustable for how you want the outside crispness to be with its fluffy and light insides. The 7-inch diameter waffles will be about 1-inch thick. You can also make one waffle at a time on only one side. The 2 LED lights illuminate to let you know your waffles are finished baking with a beep sound. Cleaning is easy and quick to do with the non-stick coating on the plates that are not removable. The handle lets you turn the plates completely over for even baking. The dimensions of the Cuisinart® waffle maker are 16.6-inches long x 16.5-inches wide x 10.2-inches tall and weighs 13-pounds. Plug the 28.5-inch UL® listed cord into a USA/Canada 110/120-Volt, 50/60 Hz outlet. In other countries you will need to buy a 220/240-Volt adapter to make it work. The 1400-Watts power gets the plates hot for thorough brown cooking. Gift-wrapping is available for someone you know who loves waffles. You will receive a User’s Manual and measuring cup. The Cuisinart® Double Belgian Waffle Maker will be free of defects in materials and workmanship under normal home use for 3-years from the date of original purchase. It is made in China. Cuisinart® Double Belgian Waffle Maker demo video. Hamilton Beach® has been making kitchen appliances for decades. 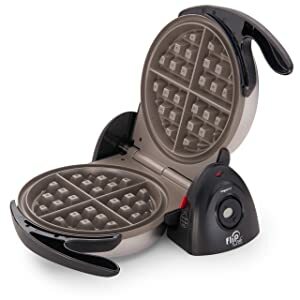 They’ve outdone themselves with this brushed stainless-steel model 26030 Belgian waffle maker that flips for fluffy insides and crisp outside edged waffles. The unit is cool to the touch and folds to take up less storage space. The non-stick plates are removable but do not have a flat back side for grilling sandwiches or making pancakes. The plates and drip tray to catch extra batter can go into the dishwasher. The device makes one waffle at a time. With the control for browning, you can have your waffles as brown as you like. The green light showing ‘on’ and ‘ready’ tell you when to add batter. It does not beep or have a timer. Preheat the unit until the light turns on then add batter and wait 5- to 8-minutes while the waffles bake. You can mix in your favorite toppings and spices into the batter such as fresh or dried fruit, chopped nuts, cinnamon, and syrups. See your User’s Manual for more instructions to do this. The Hamilton Beach® Flip Belgian Waffle Maker measurements are 9.06-inches tall x 9.9-inches wide x 14.88-deep. Plug the 2-foot UL® listed cord into a USA/Canada 110/120-Volt, 50/60 Hz outlet. In other countries you will need to buy a 220/240-Volt adapter to make it work. The power is 800-Watts. Gift-wrapping is available for someone you know who loves waffles. You will receive a User’s Manual and a 1-year Warranty for the unit to be free from defects in material and workmanship from the date of original purchase. It is made in China. Hamilton Beach® Flip Belgian Waffle Maker video. The All-Clad® Metal Crafters was founded during the great steel age in the USA in 1967 formulating bonded metals for many industries. 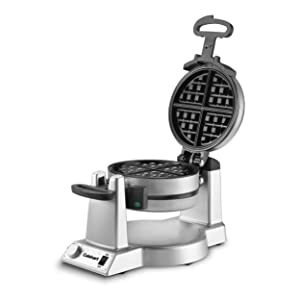 Model number 99012GT on Amazon.com® is a highly polished stainless-steel classic round waffle maker with 7 browning settings using the front knob control. 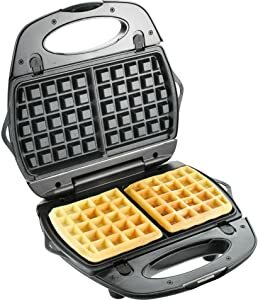 This is the classic waffle maker for thinner than Belgian waffles that I absolutely love! The plates are not removable, and they clean up quickly and easily with a paper towel. You will make waffles 6.5-inches round that are 1/2-inch thick that are crisp and brown on the outside and tender fluffy on the inside. You can cut the 4 sections individually for the kids or leave as one waffle for those who eat more. The one-at-a-time waffle maker has a non-stick coating on the 2 plates for removing the waffle easily without sticking and are easy to clean. You’ll like having the red ‘ready’ indicator light with 3-beep tones for knowing when to add the batter and when the waffles are done baking. This unit does not flip over, and the stainless-steel handles are riveted for secure handling of the hinged lid. The latch locks so that you can store it vertically to save space. Plug the UL® listed cord into a USA/Canada 110/120-Volt, 50/60 Hz outlet. In other countries you will need to buy a 220/240-Volt adapter to make it work. The power is 800-Watts. Gift-wrapping is available for someone you know who loves waffles. You will receive a User’s Manual and a 2-year Warranty for the unit to be free from defects in material and workmanship from the date of original purchase. The All-Clad® Classic Round Waffle Maker is made in China. 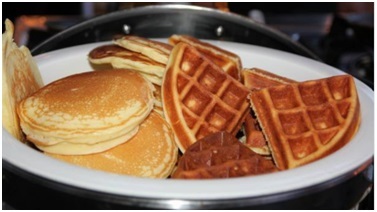 How to make waffles with All-Clad® Classic Round Waffle Maker Belgian best waffle maker video. The Breville®, model number BWM640XL shown on Amazon.com® is a square 4-slice unit with a stainless-steel housing with cast aluminum plates with a non-stick surface that is PFOA-free. It’s also available in a 2-slice model number BWM620XL. This is the best waffle maker on the market today. 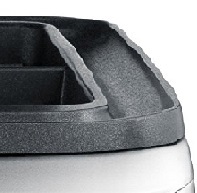 The indented trough (moat) around the sides catch any batter overflow to not run all over the place. Enjoy your waffles of different types being classic, Belgian, buttermilk, whole wheat, or chocolate. The 12 heat settings distribute even cooking for the crispy brown or lighter colored waffles you love each time. The center will be soft and fluffy adding your toppings. The plates are not removable yet are easy to wipe clean. The dimensions of the Breville® Smart Waffle™ Pro are 15-inches wide x 12-inches front-to-back x 5-inches tall. Plug the UL® listed cord into a USA/Canada 110/120-Volt, 50/60 Hz outlet. In other countries you will need to buy a 220/240-Volt adapter to make it work. The power is 1800-Watts. The more Watts the more heat. The Amps are 15. The lid locks down so that you can store it upright. The control panel on the front is easy to use to have your waffles be perfect the way you like them. If you don’t eat them all, freeze what’s left and reheat in your toaster. Gift-wrapping is available for someone you know who loves waffles. You will receive an instruction booklet, a BPA-free dosing cup for easy no-mess pouring, and a 1-year Limited Warranty for the unit to be free from defects in material and workmanship from the date of original purchase. It is made in China. The Best Waffle Maker – The Smart Waffle™ by Breville® – Designer’s comments video. 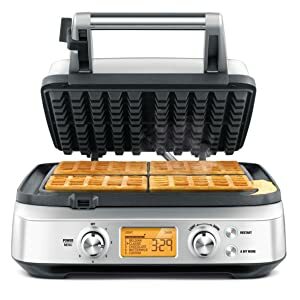 The Waring Pro® Belgian waffle maker cooks two thick, delicious Belgian waffles that are crispy on the outside and light and fluffy on the inside. The model number WMK600 is expensive but does perfect baking every time. You can adjust the amount of browning you and your family likes best with the control. 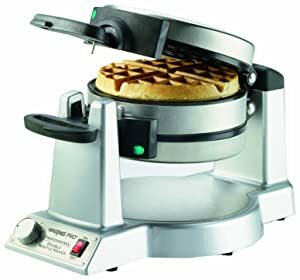 This unit is a professional quality waffle maker for home kitchen use. 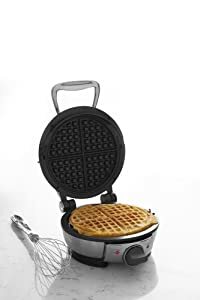 Bake 2 round waffles at the same time using the rotation feature of the maker with extra deep 1-inch waffle pockets and 7-inches diameter. You will have even baking on the top and bottom with crispy edges. Use the browning control known for the lightness or darkness you and your family prefers. The non-stick waffle plates are not removable and are easy to clean. The stainless-steel housing is simply wiped down to clean with window cleaner. You will have 2 LED ‘ready’ indicator lights with 3 beep tones indicating your waffles are done. It also illuminates a red on/off toggle switch. The dimensions are 15.5-inches deep x 9.7-inches wide x 9.3-inches tall and it weighs 10.3-pounds. Plug the UL® listed cord into a USA/Canada 110/120-Volt, 50/60 Hz outlet. In other countries you will need to buy a 220/240-Volt adapter to make it work. The power is 1400-Watts. Gift-wrapping is available for someone you know who loves waffles. You will receive a User’s Manual, measuring cup, and a 1-year Limited Warranty for the unit to be free from defects in material and workmanship from the date of original purchase. It is made in China. 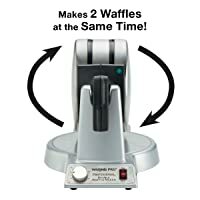 How to make Belgian waffles using a Waring Pro® Waffle Maker video. 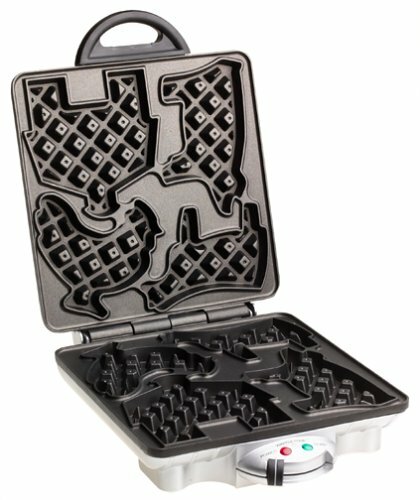 The T-fal® waffle and sandwich maker is unique in that you can make waffles or sandwiches, such as grilled cheese. The model number SW6100 EZ is inexpensive for all it does, and the plates are non-stick, removable, and dishwasher safe. On top are the ‘ready’ for cooking and ‘on’ lights and a cord storage area to wrap the cord. You will have 2 sets of plates: one for Belgian/regular waffles and the other for making pocket sandwiches. Kids love them! The waffles are about 4- x 4-inches square and regular bread is used for the sandwiches. You can make sandwiches with meat cheese, mustard, or other condiments to be grilled like the restaurants do it. Take one slice of bread and when done add fresh lettuce, tomatoes, and onions if you like. You cannot cook meat or vegetables in this unit; it’s not hot enough or made for that. Simply brush the plates with cooking oil or butter your bread on both top and bottom sides. Cleaning up is a breeze with just a paper towel but be sure to unplug the unit first and let it cool down. Warm makes it easier to clean. Don’t be burned. The unit measures 12.7-inches wide x 11.9-inches front-to-back x 6.8-inches tall weighing 4.5-pounds. Plug the UL® listed cord into a USA/Canada 110/120-Volt, 50/60 Hz outlet. In other countries you will need to buy a 220/240-Volt adapter to make it work. The power is 760-Watts. Gift-wrapping is available for someone you know who loves waffles. You will receive a User’s Manual and a 1-year Limited Warranty for the unit to be free from defects in material and workmanship from the date of original purchase. It is made in China. 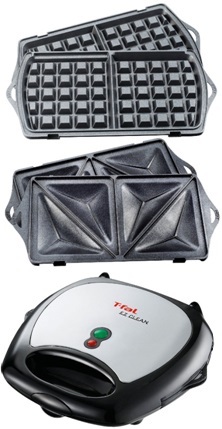 T-fal® SW6100 EZ Clean Nonstick Sandwich and Waffle Maker product images video. The VillaWare™ Farmyard Waffler model V2001F UNO is a kid’s delight with its farm animals pattern with a cow, chicken, pig, and barn. It is non-stick to clean up easily and quickly. This waffler will never hit the hay lasting for years to come. 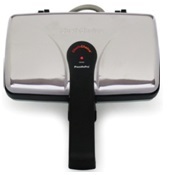 It has a built-in timer with 7 temperature settings and 2 browning levels for everyone’s favorite way for texture. The waffles are 3-1/2-inches. Just add butter, syrup, or fruit, and your kids will enjoy breakfast with no hassles to mom. Just cook up that pig for bacon! With the bird chirp the kids love, you will know when the baking is finished. The chrome housing exterior will go well with any kitchen décor. The unit measures 11-1/2-front-to-back x 7-3/4-inches wide x 3-inches tall and weighs 9-pounds. Gift-wrapping is available for someone you know who’s a kid at heart or has kids. You will receive a User’s Manual, and you may return your item within 30 days of receipt for an exchange or refund of the purchase price (less the shipping and handling charges) if you are dissatisfied. The unit is made in China. The Chef’sChoice® by EdgeCraft®, model 834 on Amazon.com® is a 2-unit pizzelle maker that is fast with beautiful looking and scrumptious tasting cookies in only 30-seconds. EdgeCraft® Corporation was established in 1985 creating the world’s best knife sharpener with their first one being an immediate success worldwide for performance and quality. The diameter is the traditional 4-3/4-inch size and it’s the perfect cannoli’s size as well. The maker has a baking indicator light, and the plates offer even heat for consistent baking. The plates are non-stick to release the baked product immediately. The lid has a latch to securely close for vertical cupboard storing. It does not have a timer but heats up in seconds. 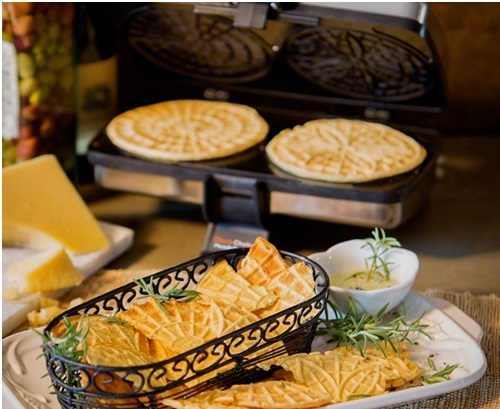 The picture is delectable pizzelle pieces on a tray with dipping sauce. You can make waffle cone bowls when they are warm by pressing them around a glass or small bowl for shape then let cool and fill with ice cream. Great recipes and ideas are included with this maker. This unit also makes German stroopwafel (say stroːpʋaːfəl) literally syrup waffle made from two thin layers of baked dough with a caramel syrup filling in the middle. 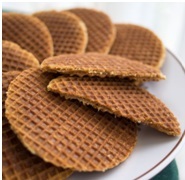 Stroopwafels are popular in the Netherlands, and were first made in the city of Gouda, the great cheese place. 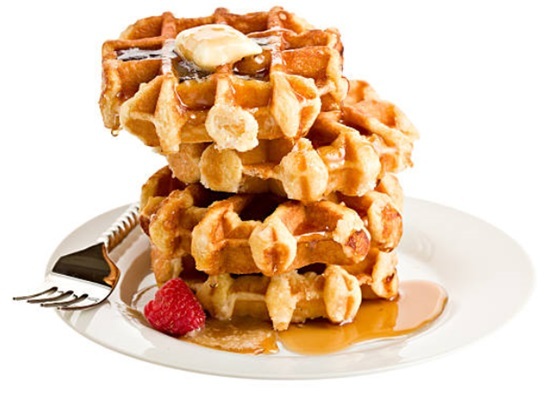 The stiff dough for the waffles is made from flour, butter, brown sugar, yeast, milk, and eggs. Medium-sized balls of dough are put into a heated waffle iron and pressed into the required uniformly thin, round shape. After the waffle has been baked, and while it is still warm, it is split into thin layered halves. The warm filling, made from syrup, brown sugar, butter, and cinnamon, is spread between the waffle halves, gluing them together. You will love them and so will your kids! 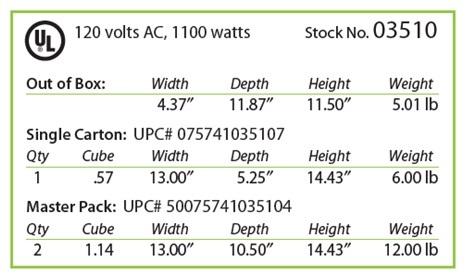 Plug the 3-foot UL® listed cord into a USA/Canada 110/120-Volt, 50/60 Hz outlet. In other countries you will need to buy a 220/240-Volt adapter to make it work. The power is 900-Watts for more heat. Gift-wrapping is available for someone you know who loves making and eating pizzelles. You will receive a User’s Manual, recipe booklet, and a 1-year Limited Warranty for the unit to be free from defects in material and workmanship from the date of original purchase. The unit is engineered in the USA and is made in China. The CucinaPro™ pizzelle maker comes in non-stick or a polished stainless-steel interior finish model 220-05PS. The item model number 220-05NSis a best seller on Amazon.com® in the black non-stick. The baking press makes 2 each 5-inch cookies at one time. This is the perfect size for cones or cannolis to be stuffed as well. With the steam guard on this press, your hands are protected. Even heat is distributed with its extra thick baking plates. The non-stick surface on the black or silver colored presses is easy to clean. Make yours to be hard, crisp, soft, and chewy depending on the recipes you use with eggs, flour, sugar, and butter. The thick or thin consistency of your batter determines the finished product. You will receive recipes and instructions, so you won’t be lost if this is your first time making these decadent cookies. Put two together for a sandwich filled with ricotta and sugar or hazelnut spread. Peanut butter is good too and kids love it. While they are still warm, use a glass or dowel to make ice cream cone shells and fill with your favorite goodies. You can also buy cone shapes for making your own cream puffs or waffle cones. It does not have a timer but use your microwave timer or the second hand on your watch. Push the lid down and latch it. When the steam is almost gone, the pizzelle is ready. It does have a green light that comes on when it is fully heated and ready to cook pizzelles. The plates are not removable. The dimensions are 10.2-inches wide x 10-deep x 5-inches tall weighing about 5-pounds. Plug the 3-foot UL® listed cord into a USA/Canada 110/120-Volt, 50/60 Hz outlet. In other countries you will need to buy a 220/240-Volt adapter to make it work. The power is 750-Watts for more heat. Gift-wrapping is available for someone you know who loves making and eating pizzelles. You will receive a User’s Manual, recipe booklet, and a 30-day Warranty for any defects. The unit is made in China. CucinaPro™ 220-05NS Non-Stick Pizzelle Baker video. How to Make Pizzelles | Cookie Recipe | All Recipes video. Any waffle maker can do added ingredients in small pieces in the batter such as chocolate; maple syrup; honey; cinnamon sugar; maple butter; chopped fine pecans; chopped walnuts; chocolate chips; raisins; coconut; fresh or dried fruit, blueberries; blackberries, and strawberries. Grade B maple syrup has the most flavor. Waffle makers with removable plates are dishwasher safe. Never used steel wool or scouring pads, sharp knives, or abrasives on the units. Oil the grids with cooking oil, coconut oil, or use butter. Don’t use cooking sprays because they get gummy over time and are hard to remove. The temperature of the plates determine the browning and crisping of waffles. If the lid doesn’t pull up, the waffles aren’t done. Wrap leftover waffles in wax paper each, put in a plastic bag and store in the freezer to pop into your toaster for later use. For thin waffles use thinner batter; for thicker waffles use thicker batter. Use glass cleaner to polish stainless steel and a soft toothbrush to remove stuck-on crumbs. 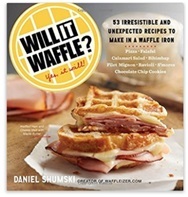 A great waffle recipe book, Will it Waffle?—is on Amazon.com. 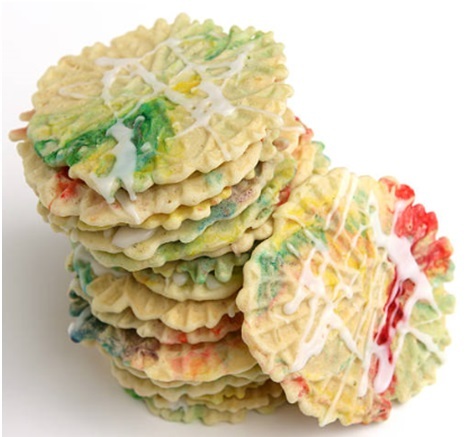 I just know after you’ve watched the videos you are just drooling to make your own good tasting food whether waffles or fancy pizzelle cookies. The units are inexpensive and are useful for many years. Leave me a comment or question and I will reply to you. Happy shopping!